Time: 5 hrs. 45 mins. 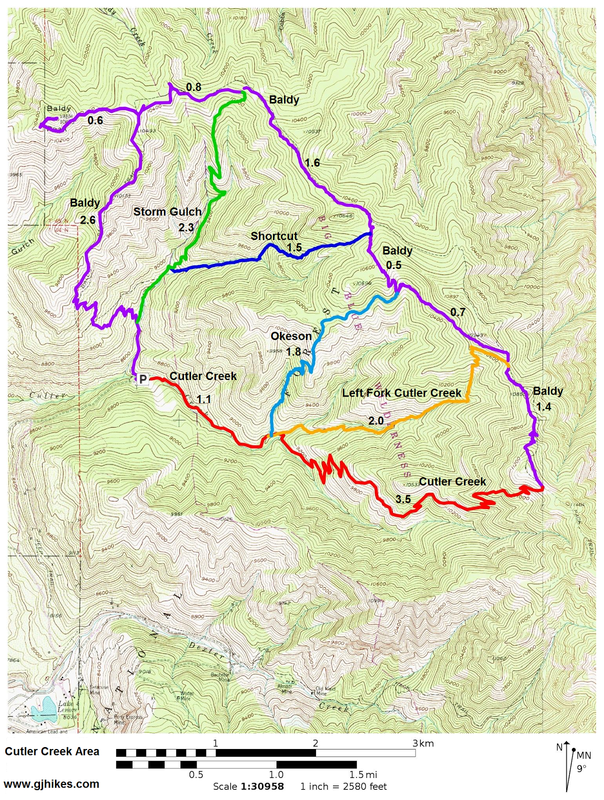 The Cutler Creek trail is located in the Mountain Division of the Uncompahgre National Forest and the Uncompahgre Wilderness Area near Ouray, Colorado. Cutler Creek is part of a group of trails in the drainage by that name that all start out below 9,000 feet and climb up to the Baldy trail on Baldy Ridge where the elevation is typically above 11,000 feet. 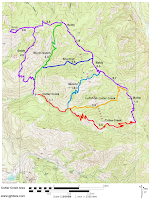 All of the trails are within an aspen and conifer forest that lies mostly within the Uncompahgre Wilderness Area. At the higher elevations distant views of many of the areas alpine peaks, including Uncompahgre Peak (14,308), Wetterhorn Peak (14,016) and Mount Sneffels (14,157) are visible. For this post we make a loop hike by traveling up the Cutler Creek trail to Baldy Ridge and following that trail over to the Left Fork Cutler Creek trail which we hike down to close the loop and retrace the first mile of the Cutler Creek trail back to the trailhead. 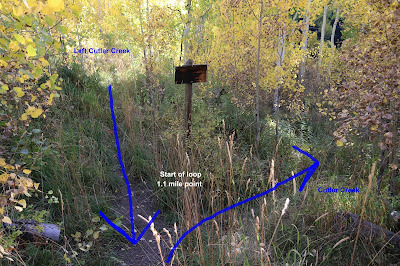 The trail travels a ways from the trailhead and crosses Cutler Creek before reaching the registration station. Entering your information in the register is a good way to let Search and Rescue know your plans if they are ever called upon for their services. Not too far past the trail register the route crosses into the Uncompahgre Wilderness Area where wilderness rules apply. The trail does a little moderate climbing as it heads up along side of Cutler Creek. Just past the 1 mile point from the trailhead the Okeson trail branches off on the left and begins its run up to Baldy Ridge. Within about 50 yards of where the Okeson trail begins the Cutler Creek trail comes to the point where the Left Fork Cutler Creek trail also begins. 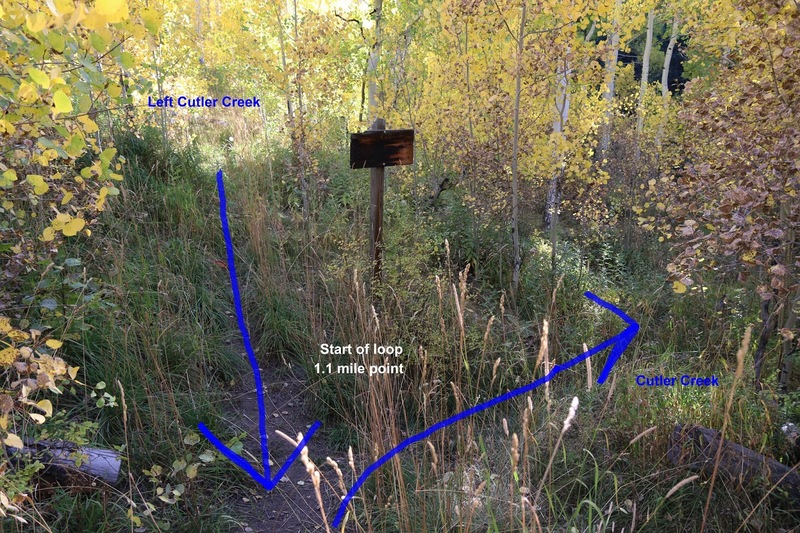 This is where the loop commences for this hike as we stay to the right on the Cutler Creek trail. 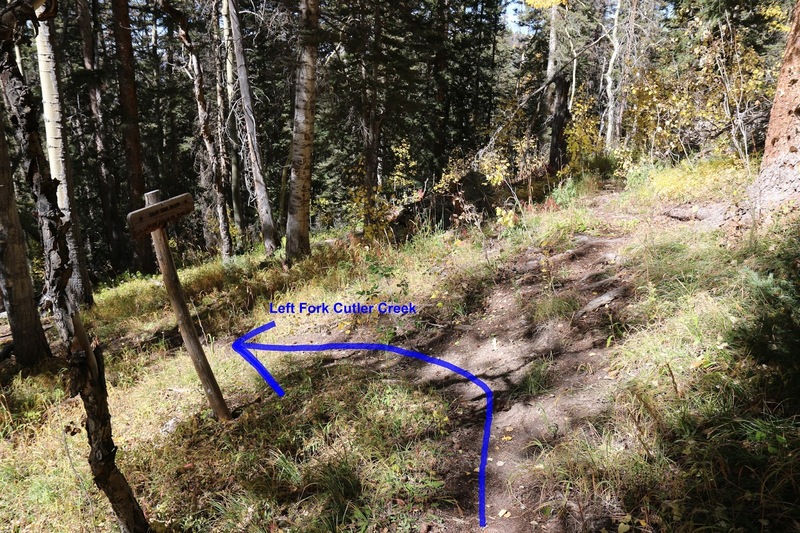 A person could hike the loop in the other direction by going up the Left Fork Cutler Creek trail but it gets pretty steep in places as does the upper portion of Baldy Ridge. The main Cutler Creek branch does its own share of climbing. It spreads it out over 3.5 miles of trail though. Wherever the trail builders felt the slope of the mountainside was getting too steep for a direct ascent they threw in a few switchbacks to ease the trail upwards. As the trail gets up around 10,000 feet it spends a little more time out in the open. The climbing eases off in places where the trail makes long traverses around the hillsides gaining more distance than elevation. Eventually the trail makes it to where Baldy Ridge comes into view. When the trail gets high enough you can look back and see some pretty good scenery towards Ouray and Mount Sneffels. You can even see over the ridge to the south and get a good look at the alpine area around the Bridge of Heaven. 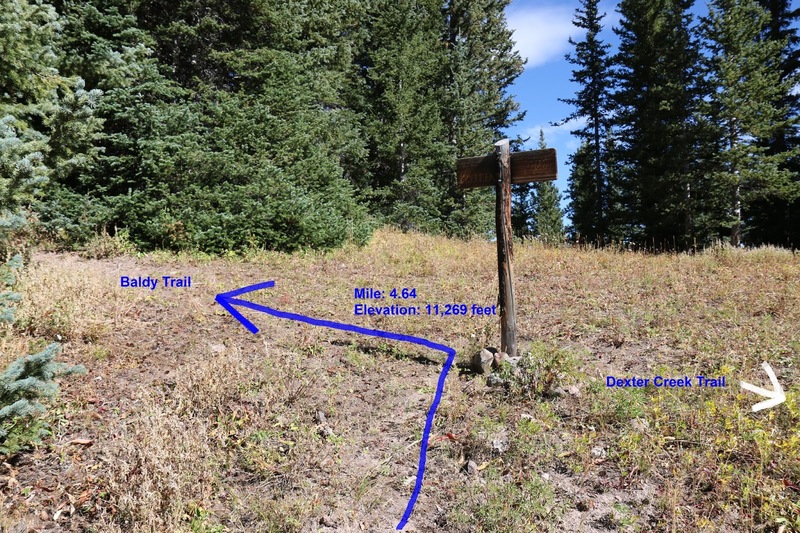 After a little more than 4 and a half miles of hiking the Cutler Creek trail comes to an end on the ridge where it junctions with the Baldy trail, that we will follow to the left, and the Dexter Creek trail that begins on the right. There are a lot of nice places to set up a camp in this area if you happen to be backpacking. After making the left turn on to the Baldy trail you can climb a little knob where you can get the best views of Uncompahgre and Wetterhorn Peaks to the east as well as everything else to the south and southwest. For the most part the section of the Baldy trail between the Cutler Creek and Left Fork Cutler Creek trails is very pleasant to hike. It does have some very steep sections though that fortunately going in this direction are all downhill with pretty fare footing. 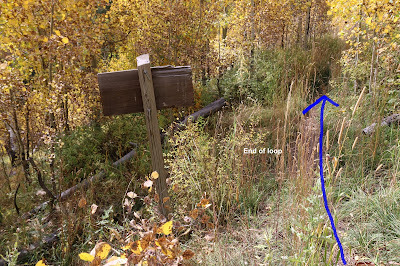 It is about a mile and a half down the Baldy trail to where the upper end of the Left Fork Cutler Creek trail begins. The Left Fork pretty much makes a beeline down from the ridge to get back to the Cutler Creek trail. While it took the Cutler Creek trail 3.5 miles from the start of the loop to get to the ridge it takes the Left Fork only 2 miles to get back down. This view of Whitehouse and Mount Sneffels is one of the scenic treats while hiking down the Left Fork Cutler Creek trail. The loop comes to an end back at the Cutler Creek trail where the elevation is back down to 9,000 feet and it is only one more mile back to the trailhead. There are lots of options for hiking in the Cutler Creek area when it comes to backpacking or hiking various loops. 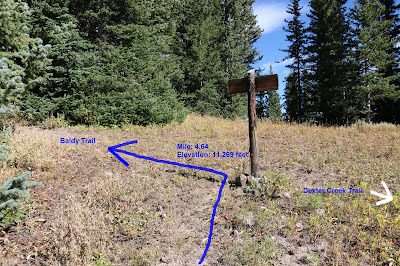 We could have extended the hike by continuing along the Baldy trail to the Okeson trail and returning that way or by going even further to the Cutoff or Storm Gulch trails. For the grand tour de force we could have hiked the entire length of the Baldy trail and closed the loop by hiking along the road for about a quarter mile between the Baldy and Cutler Creek trailheads. However you choose to do it if you would like to see it for yourself then all you have to do is 'Take a hike'.